Anyone bemoaning a lack of close racing in their chosen motorsport would do well to tune in to the MotoGP support races. 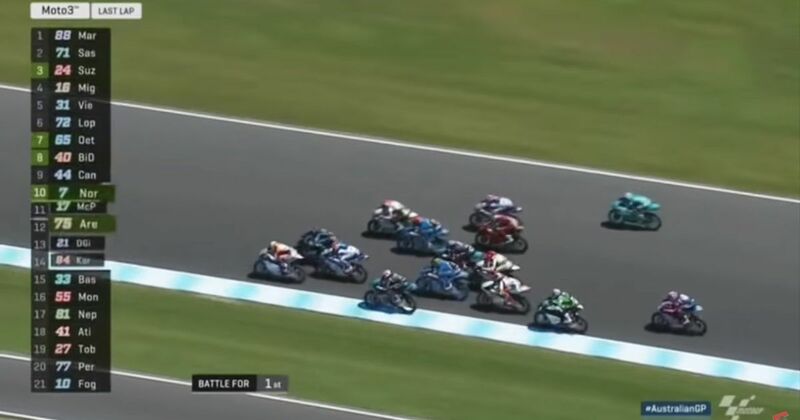 Check out this totally crazy footage from the Moto3 race at Australia’s Phillip Island yesterday. This isn’t the crowd away from the start line: it’s the melee going across the start/finish line into the final lap. The initial cluster sees 15 bikes packed tighter than Big Narstie in a Smart ForTwo, all vying for the win with just one lap to go. The top 10 are, as we watch, separated by a couple of tenths of a second. Close enough for you? The fantastic paint-swapping duel was eventually won by the number 75, Albert Arenas, who sneaked up the inside of the pack and got into turn one as the leader, before holding his position for the final loop of the premier-division circuit.